Let’s talk about the priority of Windows processes. In most cases, there is no need to think about the custom process priority settings, but sometimes a qualified system administrator can help a system to better allocate the processor time between running tasks. When is it needed? 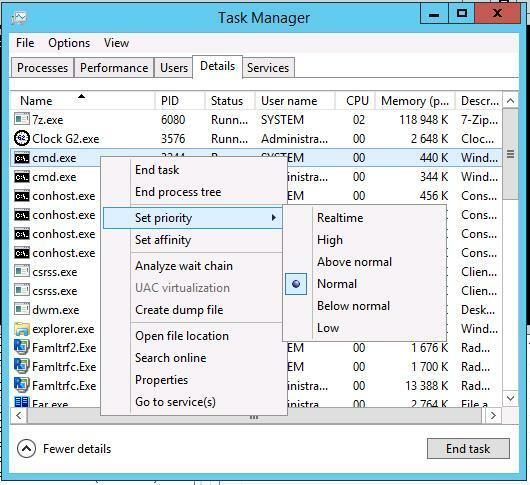 For example on the application server, you can give more CPU time for application and SQL server, as the most resource-critical processes. In Windows Server 2012, these settings are located on Details tab. Now let’s see, what it actually looks like. In fact, there are 32 priority levels in Windows, from 0 to 31.
or Idle class (value 4). 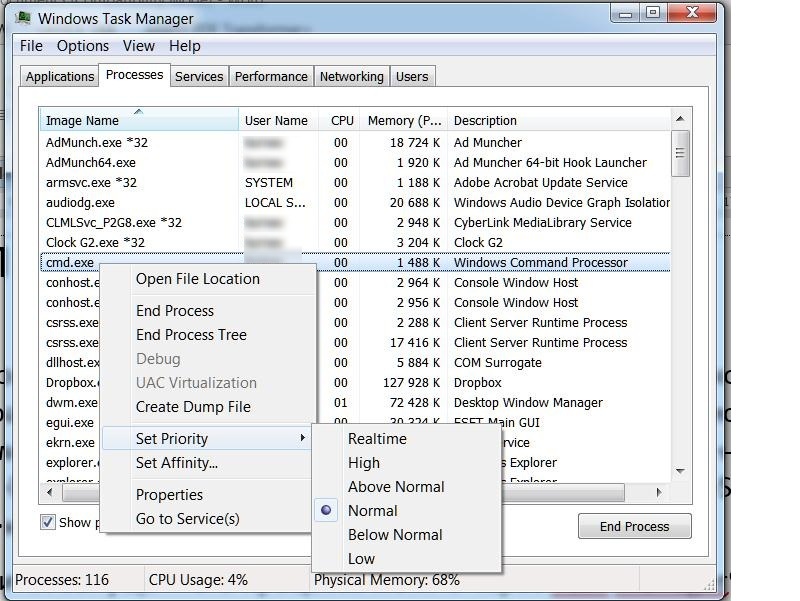 As it has been mentioned above, you can view the process priority using Task Manager. Note. Above normal and Below normal priorities first appeared in Windows 2000. The following table shows process priorities, relative and current priorities of a thread. How to start a process with a non-standard priority or change it? The priorities are changes with your mouse and you cannot make it automatic. As shown above, Task Manager and START command are quite awkward in assigning priorities. Let’s see how to do it more flexibly. We’ll use wmic.exe. Note. What is to be done if there are several processes with the same name? The priority of a process can be changed using both its name or the PID (Process ID). Here is a short example of running wmic.exe to get the necessary information. Note. I won’t give the example of running this command as the list of processes is too long. Do it yourself if you want to. I have deliberately started several copies of cmd.exe, to make it more demonstrative. Now the list of processes is limited to those having “cmd.exe” in their name. Pay attention to the PID of the process(es). Compare the results. Remember the PID of CMD.EXE. What next? Think, try, select and manage your priorities to improve the performance of services and processes, together with the end user experience. Hi, thanks for this article…. cmd.exe /c start "CMD" /High "C:\Windows\System32\cmd.exe"